The 2013 indirect auto lending guidance from what was previously called the Consumer Financial Protection Bureau now is officially off the books. On Monday, President Trump signed into law a bipartisan Congressional resolution disapproving a rule that was in the form of guidance issued by the regulator that now calls itself the Bureau of Consumer Financial Protection about indirect auto finance company compliance with the Equal Credit Opportunity Act (ECOA) and its implementing regulation. “I thank the President and the Congress for reaffirming that the bureau lacks the power to act outside of federal statutes,” acting director Mick Mulvaney said in a statement released by the regulator. “As an executive agency, we are bound to enforce the law as written, not as we may wish it to be. In this case, the initiative that the previous leadership at the Bureau pursued seemed like a solution in search of a problem. Those actions were misguided, and the Congress has corrected them. “I want to make it abundantly clear that the bureau will continue to fight unlawful discrimination at every turn. We will vigorously enforce fair lending laws in our jurisdiction, and will stand on guard against disparate treatment of borrowers,” Mulvaney continued. “I am heartened that the people, through their elected representatives, have corrected this instance of bureau overreach. I look forward to working with the Congress to bring much-needed structural accountability to the Bureau so that our cherished democratic principles are supported and the rights of every American consumer are always protected,” Mulvaney went on to say. The stroke of Trump’s pen came with cheers from the industry. “This is a great day for consumers, as Congress and the president have helped to preserve their ability to receive auto loan discounts from local dealerships,” National Automobile Dealers Association president Peter Welch said in this blog post. “NADA congratulates the U.S. House and Senate for their focus and perseverance on this issue, and the president for signing the new law to protect consumers,” Welch continued. American Financial Services Association president and chief executive officer Chris Stinebert shared a similar sentiment. 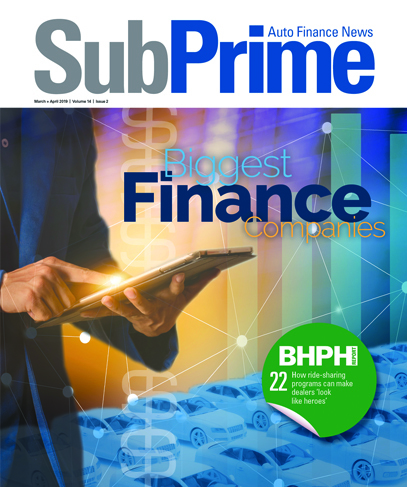 Stinebert likely will be talking about this development and more when he appears during the 22nd annual Non-Prime Auto Finance Conference hosted by the National Automotive Finance Association beginning on May 30 in Fort Worth, Texas. Before the measure landed on Trump’s desk, the House earlier approved S.J. Res. 57, which was written to overturn the much-criticized guidance document under the authority of the Congressional Review Act, by a bipartisan 234-175 majority. The Senate had already passed the joint resolution on April 18 by a 51-47 margin. Mulvaney went into more detail regarding the impact of what Trump and federal lawmakers have done. “The enactment of this Congressional Review Act (CRA) resolution does more than just undo the bureau’s guidance on indirect auto lending. It also prohibits the bureau from ever reissuing a substantially similar rule unless specifically authorized to do so by law,” Mulvaney said. “Given a recent Supreme Court decision distinguishing between antidiscrimination statutes that refer to the consequences of actions and those that refer only to the intent of the actor, and in light of the fact that the bureau is required by statute to enforce federal consumer financial laws consistently, the bureau will be reexamining the requirements of the ECOA,” he continued. “Today’s action also clarifies that a number of bureau guidance documents may be considered rules for purposes of the CRA, and therefore the bureau must submit them for review by Congress,” Mulvaney went on to say. “The bureau welcomes such review, and will confer with Congressional staff and federal agency partners to identify appropriate documents for submission,” he added.